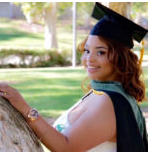 Brittany earned her BA in Psychology with a Minor in Africana Studies from San Diego State University. She went on to California State University, Long Beach to achieve her Masters in Public Health emphasizing in Community Health Education. Upon completion Brittany set forth to establish her business educating children in her hometown of Compton, CA. Her interests are in primary education, community outreach, and provider relations. She channels her passion for health, wellness, and beauty into her blog “Pretty Presence” but also has fun travelling or attending live music events!